Canadian news consumers have embraced mobile devices and social media for their fix, but still view traditional outlets as the most trustworthy source. Social media and mobile phones have become preferred options for news consumption among a growing number of users. However, in Canada, as in other countries among the 36 surveyed for the 2017 Reuters Institute Digital News Report, it appears that most people still consider traditional media or their brands the most trustworthy sources. The report is part of an ongoing comparative study of news consumption that includes researchers around the world, with the Centre d’études sur les médias (CEM) as the Canadian partner for the study. The CEM supervised the data collection, compiled and analyzed the findings for Canada. 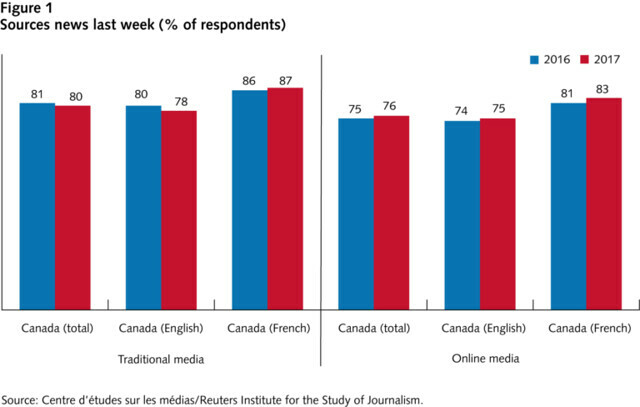 Based on an online survey of 2,531 Canadians (1,529 English-speaking and 1,002 French-speaking), consumption in traditional formats (radio, television, and print) remains relatively stable in 2017 compared with 2016 – about 80 percent of respondents say they use them regularly 9 (see figure 1). But younger and older Canadians are less likely to have a news diet consisting mostly of traditional news media than they were a year ago (21 percent of people under 45, compared with 26 percent in 2016, and 51 percent of those 45 and older, compared with 54 percent in 2016). More than three out of four Canadians in 2017 got news from traditional media (radio, print, television) in the week preceding the survey. About the same proportion of Canadians in 2017 used online news sources (figure 1). However, in 2017, 50 percent more respondents consider traditional media their main source of news, rather than online media. (figure 2). Men tend to favour apps and websites associated with traditional media, rather than social media platforms, when getting their news online; women use both the traditional media’s platforms and social platforms in roughly equal proportions. Smartphones are becoming more popular as the main device to access news (29 percent of respondents versus 26 percent in 2016), but still, 53 percent are most likely to use a computer (desktop or laptop). About 45 percent of Canadians use a tablet daily, but francophones are more inclined than are anglophones to use them to follow the news (28 percent, compared with 21 percent). These proportions did not significantly change in 2017 over the year before, except among French-speaking people between 45 and 54 (26 percent in 2016, 36 percent in 2017). Although this result among French-speaking people is relatively high, Sweden and the United Kingdom show similar levels of tablet use for news. French-speaking Canadians turn massively to Facebook to read, share and discuss news: 51 percent, compared with only 37 percent of anglophones. Among francophones, young people (71 percent of those aged 18-34) and women (61 percent) are especially avid users of this platform. Internationally, these Canadian francophone respondents are surpassed by only a few countries in Latin America (Argentina, Chile and Mexico) and Europe (Hungary, Romania, Greece). Yet, a majority of Canadians who use Facebook for news say that more often than not, they find news there while on the social network for other reasons. Indeed, for 26 percent of online news consumers, social media was the principal means by which they got news in the week before the survey. It comes as no surprise, then, that social media occupy a greater place in the media diet of people who admit having little interest in news. Meanwhile, 45 percent of online news consumers are likely to use a specific news source, by using its app or website – sometimes found via search engines. 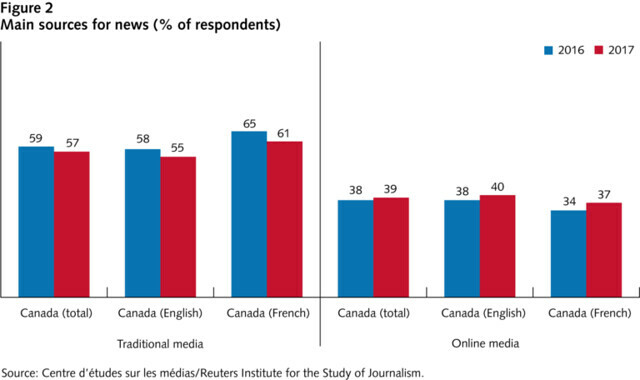 Canadians overall are rather critical of social media. While 51 percent consider that news media help them distinguish fact from fiction, a belief most strongly held by older respondents, only 24 percent think social media are useful for this purpose. This is consistent with the idea that social media are the online equivalent of the coffee shop or water cooler: they are good places to discuss current affairs, socialize and be entertained, but not necessarily serious information vehicles. It is also interesting to note that those who report low trust in traditional news media do not hold social media in high esteem either. 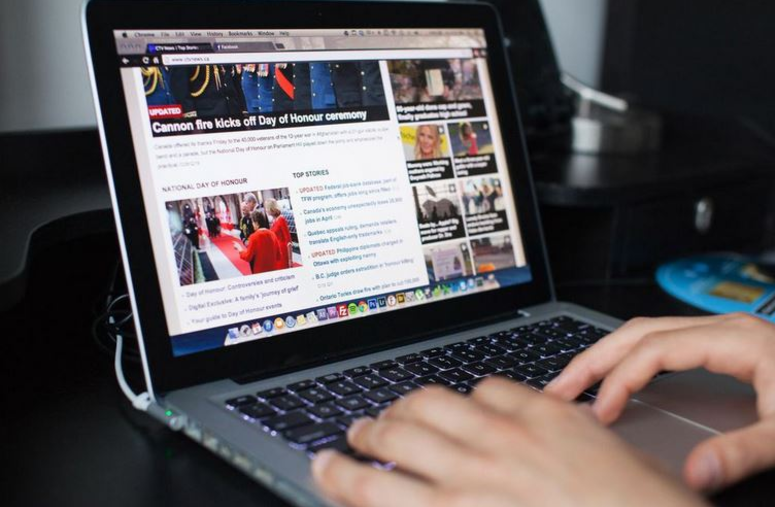 When asked which online source is the best for providing accurate and reliable news, two-thirds (68 percent) of the respondents choose one that has its roots as a traditional media outlet. This figure is higher among those under 35 (71 percent). 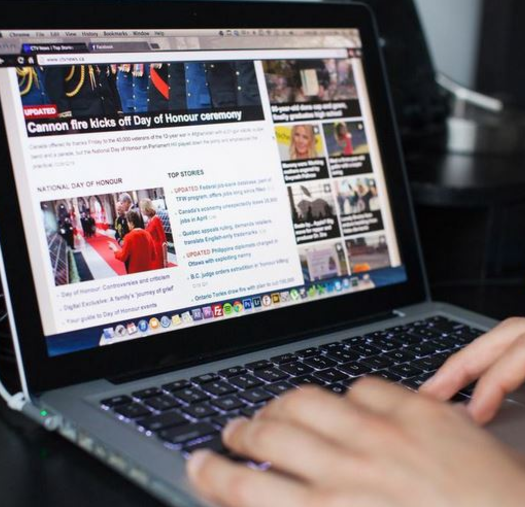 When it comes to paying for news consumed online, the idea has not made its way into the hearts of Canadians: while 30 percent of respondents said they had paid for a print newspaper in the previous week, only 8 percent had paid for online news in the past year. Among those who had not, only 10 percent expect to pay in the near future. The reasons people pay for news are varied (it allows them to get news from their preferred source, their preferred source is not available for free, or they took up an appealing offer). However, among those who choose not to pay for news, one reason stands out: their ability to access content for free (57 percent of respondents). Only 12 percent say it is because they are uncomfortable using a payment system online. In short, if traditional media in Canada and elsewhere are going through difficult times economically, the Reuters Digital News Report data suggests that they have yet to be replaced as the collective reference for quality news. Can traditional media companies leverage the public’s trust to rebuild a viable funding model for news? Or can these positive attitudes be mobilized into support for policy solutions to help sustain Canadian news providers, both established and emerging? 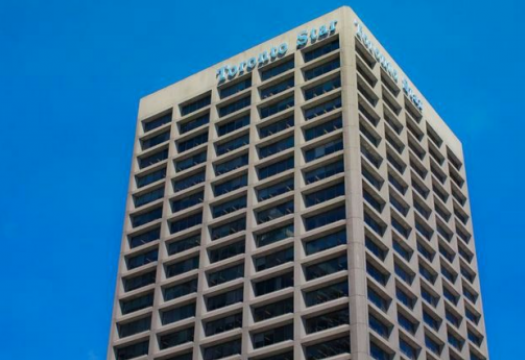 Our data, and previous studies such as the survey produced for the Public Policy Forum’s study on the state of Canadian news media, The Shattered Mirror, suggest that Canadians are not eager to reach into their wallets. But it doesn’t mean they will not do so in a crisis, or if they no longer have a choice. This story first appeared on Policy Options, and is republished here with the author’s permission.